The medieval creation of symbolic creatures and the implications therein regarding reality. The shift in perspective with the dawning of the age of reason and insanity. Modern monsters in some further fashion. 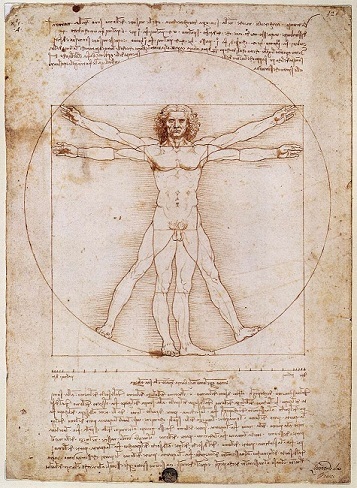 Take a moment to consider the Vitruvian man, the Da Vinci image of a human being. It’s usually seen as the prototypical, geometrically and proportionally perfect representation of the human body. Based on that image, on the idea of the ‘standard’ human being, we have created most of our monsters and imaginary creatures. The transformation that man undergoes, in order to become a monster, can occur on any number of planes and scales. The end result could be unrecognizable as the “descendant” of the original form, or it could almost be nigh-indistinguishable from their template. Examples of both abound in popular and classic cultural expressions, beginning with the Greek Gods (simultaneously abstract and human), and during our time, such as comic superheroes and horror-movie creatures. While the significance and modes of the transformations that the human form undergoes in order to create Zeus or Spiderman vary greatly, the pattern is much the same: Take the human form, the idea of a human being, and distort it in some specific fashion. If you imbue man, burdened with all his concerns and desires, with the idea of savage the, incomprehensible power of lightning (that is, from the ancient Greek context), you get Zeus. Take the Vitruvian man, the idea of him, and combine it with the idea of a spider, you get, yes, Peter Parker. Now, these transformations occur within their own contexts (Zeus is eminently Greek, while Spiderman is eminently American), and the renditions can vary wildly from one artist to the next. However, every single sculptor or comic artist who takes it upon themselves to depict these creatures has to contend with the idea, and at the core of it, you will find the Vitruvian man; man and lightning for Zeus, man and spider for Peter Parker. This might seem obvious on the face of it, especially with such monsters as werewolves, vampires, the minotaur, or any vaguely anthropomorphic being. But aside from the physical transformation, which is plain and direct, there is another distortion taking place, one that isn’t as blatant. That secondary transformation, which takes place beneath the surface, is what makes these creatures so evocative, attractive to our imagination. If that secondary transformation doesn’t take place, the creature we’re left with is a graceless pastiche. To try to define what that secondary transformation is we have to look back at the Vitruvian man once more. That image depict man wholly, including all of the necessary pieces and components, with the right proportions, and in proper relationship with one another. Two arms, two legs, ten fingers; all the basic pieces are there. However, we immediately assign another set of characteristics to a human being, such as empathy, the ability to feel pain, the strain between his natural and societal urges, and so on. The same process takes place when we see, for example, the image of a wolf. We immediately assign a certain number of characteristics we’ve collected in relation to the idea of a wolf. Those characteristics can come from a large number of sources, such as our culture, our subconscious, our personal experience. All of those impressions inform the idea of “wolf” we have in our minds, changing over time as culture shifts. Those shifts in how wolves are perceived, incidentally, also change how werewolves are imagined, bringing us back to the secondary transformation once more. If we distort the idea of man by superimposing the idea of wolf on it, we create a new idea that will combine characteristics from both. A beastly, instinctive man who can be, simultaneously, a rational, calculating wolf. Once again, the characteristics that are added, removed or emphasized are up to the artist, who, in turn, are working within their cultural context. Nevertheless, the combination of wolf and man is not so far-fetched. They are both living creatures, mammals, land-dwelling, social, etc. There has been a long and storied tradition of wolf-men, appealing in different ways to the psychic needs of their times, which just goes to show how natural such a combination appears to the human mind. So, having established this foundation, let’s move on to something a little more abstract. What about combining a man with an abstract idea, such as justice, charity, or madness? For those of my generation, Superman is perhaps the most immediate referent of such a concept, though there is a slight chicken-and-egg problem, given how the character evolved from its creation. In his current incarnation, nevertheless, he can be viewed as an avatar of the abstract concept of justice, as well as a large panoply of other high-minded concepts. In fact, as of the late eighties and early nineties we see that superheroes, whose creation used to orbit around their powers, come to embody such abstract ideas. Frank Miller seems to be a driving force behind this shift, so much so that I’m entirely comfortable for hailing him, or blaming him for it. Others have spoken to the subject of the whys and wherefores of the change in superheroes far more eruditely than I ever could. Suffice to say, the change hasn’t gone unnoticed. Their study of how those mechanics affected those cultural icons, however, stops at the water’s edge. There was a cultural shift that transformed the needs superheroes fulfilled, and therefore superheroes changed as well; this is a generally accepted fact. There have been other examples of these transformations in the past. Umberto Eco explores them from his unique perspective in Baudolino, once his troupe arrives to the legendary city of Prester John. That city is inhabited by creatures that are human, though changed and deformed in significant and entirely medieval ways. Men with a single foot, others with their face in their chest, pygmy-like savages, and so forth, live in that imaginary city. However, their transformation was not due to man encountering an idea. Instead, they were transformed to incarnate their own brand of religious heresy, such as emphasizing the Virgin Mary in their belief, or doubting the divine nature of Jesus. Baudolino is full of such creatures throughout the entire journey it narrates. Unlike the other examples we’ve examined, these human beings are distorted because of their own thoughts, rather than being, for one reason or another, having an external, abstract idea superimposed on their own. It could be argued that the idea is the result of their deformity, which is another interesting path to follow in regards to the distortive forces the human form can be subjected to. However, in this case, we have to remember that these creatures are still, in some way, human. That means that their initial template, their proportional form is the one depicted in the Vitruvian man, which then can only lead us to conclude that they are man, transformed. So, to summarize, certain monsters are made by taking the human form, superimposing (abstractly speaking) an idea on it, and then depicting the resulting combination. Salt to taste, of course. The end result, as always, depends on the artist’s context. They are the entity that interprets the elements and decides what to emphasize or reduce. The artist’s job when creating a monster, to put it in other words, is to decide what it is that makes us human, and transform it to create a new creature. Whether that decision is based on a rational effort or a subconscious urge is dependent entirely on the artist; both approaches are valid, but there are risks associated to each. A monster created from the subconscious alone might be completely indecipherable by anyone except the artist, while another created through a conscious, guided effort might be entirely unconvincing. When the proper balance is struck, however, the results can be inexplicably haunting. The relationship between the creatures and the world they inhabit is another subject with a set of interesting questions, but I won’t go into those here. What I will say is that a creature, by virtue of its existence, has to have an influence in the literary world in which it exists. The nature of its influence can be as varier as the nature of the creature itself, but that influence is necessary. Otherwise, the creature is an superfluous detail, one which doesn’t have a place in the world that surrounds it, but not in the sense of the “outsider”. “The Outsider”, as a trope, focuses precisely on the influence that the “odd man out” has on an environment that is unfamiliar to them, making the influence itself the message, while the outsider would be the narrative vehicle for it. This, in turn, also establishes an equivalence between the fictional world and the narration, though the relationship between the two can be far more complex than that. Those questions have been explored far more eloquently than I would ever dare by Jorge Luis Borges, a true master of the artform. The superposition of other ideas and creatures on the human form has yielded some of the most enduring monsters in our culture, but it isn’t the basis for all, or even most imaginary creatures. Rather than beginning with the basis of a human being, which is tangible enough, other monsters have an abstract origin. That is to say, the idea preceded the creature. So, we don’t have a distortion of a human being, but rather the incarnation of an idea, a message that an artist sought to express. These ideas, especially in the middle ages for reasons that’d take a greater understanding of my own of medieval thought, are fairly complex. The most direct example of this kind of transformation can be appreciated in the art of heraldry, in which creatures serve as symbols to represent the quality or a notable deed. The significance of each creature was part of a code that was based on the cultural perception of an animal, such as how lions are seen as symbols for nobility, horses for loyalty, eagles for wisdom and sagacity, and so forth.